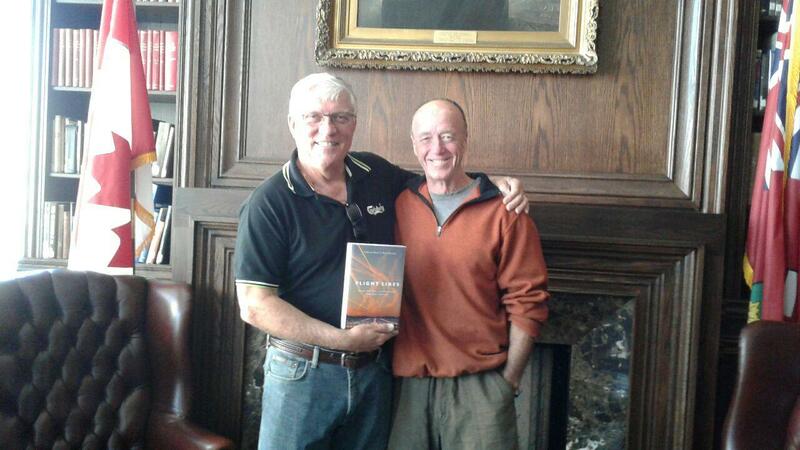 A shot of Barry Kennedy and myself (taken by bride Liz) in front of the fireplace in the spectacular new library/museum at the Royal Canadian Military Institute on University Avenue in Toronto in September 2017. 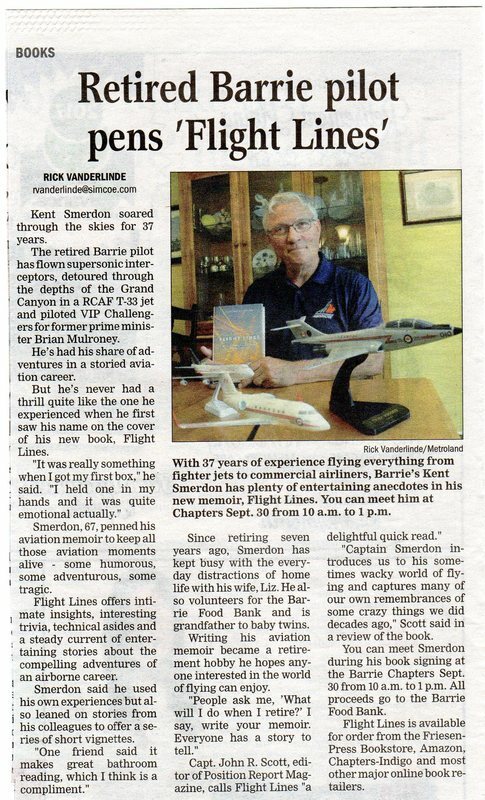 Mr Kennedy, an ex fighter pilot, actor and published author himself, contributed generously to the Flight Lines project, giving of his limited time to copy edit and to the penning of a memorable Foreword to the book. This was all done "long distance" and believe it or not, this was the first time we had met face to face since we met for a beer in Vancouver at least 10 years ago. I was flying the 767 for Air Canada and had a long enough layover to track him down. Love you Barry! It won't be another ten years, I promise! 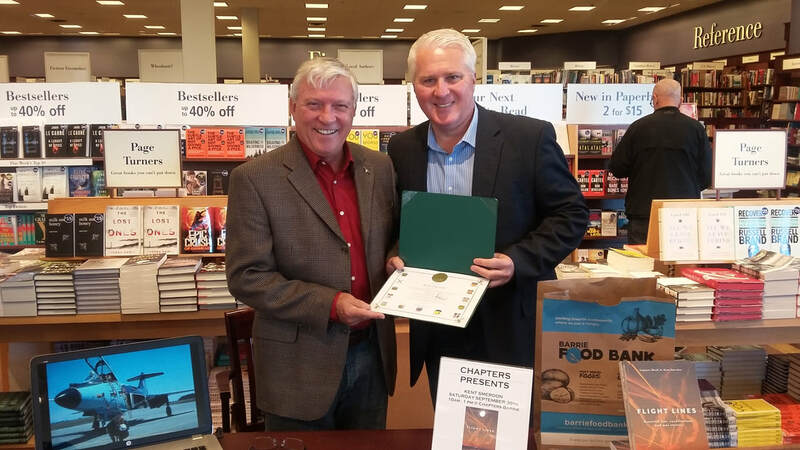 Chapters Books in Barrie hosted a book signing for me near the end of September. It was a pleasant experience, I met some neat people and even signed and sold some books! As Liz points out "even to some strangers"(!) De-briefing on that crack later. 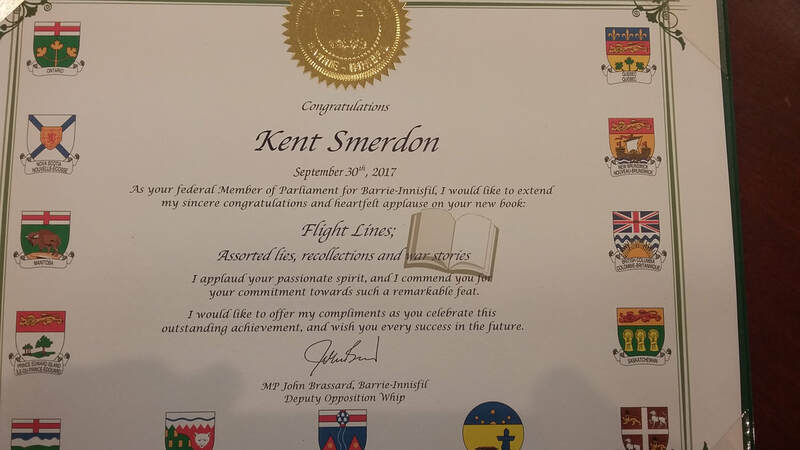 Anyways the highlight of the morning was when John Brassard, our Conservative MP for Barrie-Innisfil dropped by unannounced with a staff photographer and presented me with a bound certificate of congratulations on the writing and publishing of "Flight Lines". A nice touch for sure. He bought a book too!